To me, the end of the year can sometimes feel like a spinning wheel of to-do lists. We try and stop to enjoy the little moments, but it can be overwhelming. Deadlines need to be reached, cookies to be made, gifts to be bought, and not to mention you need some time to work out, because you need to feel good about filling up on all that delicious Christmas cheer. What I’m trying to say is that there are not enough hours in the day, and there are times when you just need a quick bite to get you through to your next task. 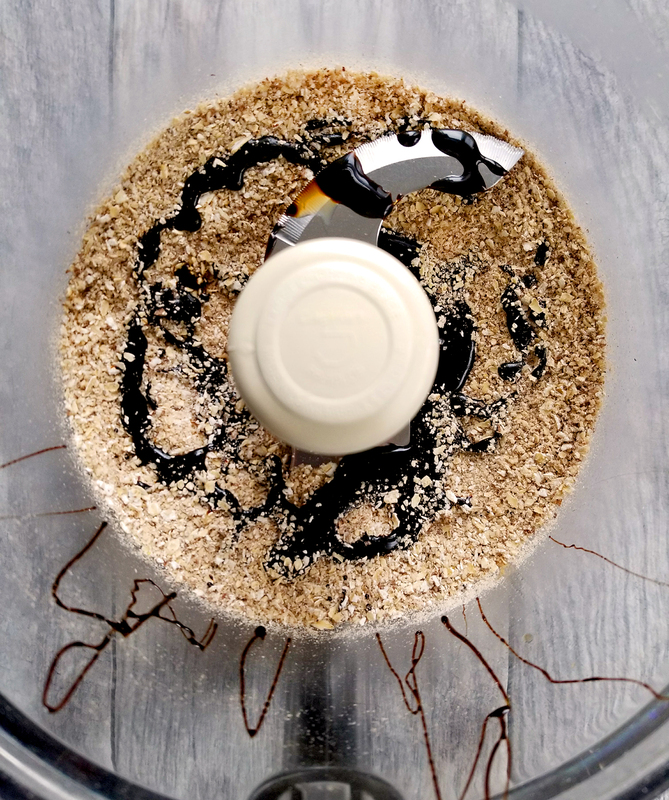 I wanted to create a snack you could eat anytime, anywhere that tastes like your favorite holiday cookie but doesn’t leave you feeling guilty. To make a bite of food that was chewy, filling, warming, and comforting, what better flavor to mirror than gingerbread! To make a complete bite, I wanted to incorporate whole grains, healthy fats, whole fruit, and antioxidant rich spices. 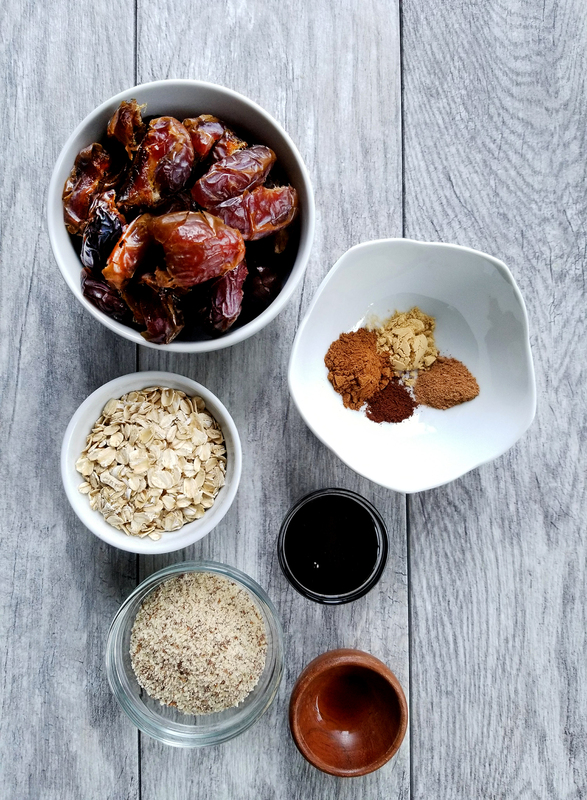 I used rolled oats, almond meal, fresh dates, blackstrap molasses, and warming spices. The filling is dense, chewy, rich, and spicy. 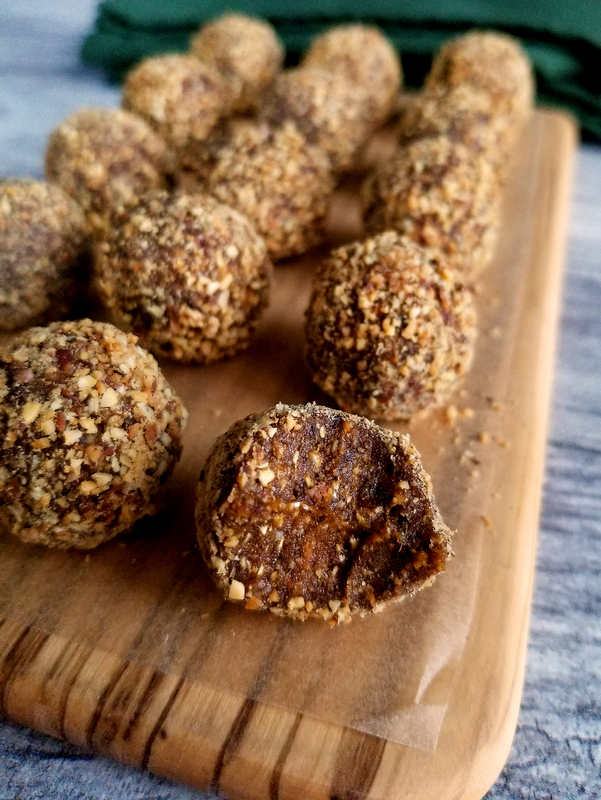 The balls are coated in toasted almond meal to give the bite a toasty nutty finish. Perfect for school lunches, work, post workout snack, or just to have in your car as “emergency food” while you are running around town getting things done. 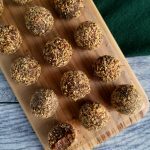 Not only are these bites easy to make, they are naturally GLUTEN FREE! Perfect for most restricted diets or picky eaters. All you need is a food processor, holiday music, and nimble hands! 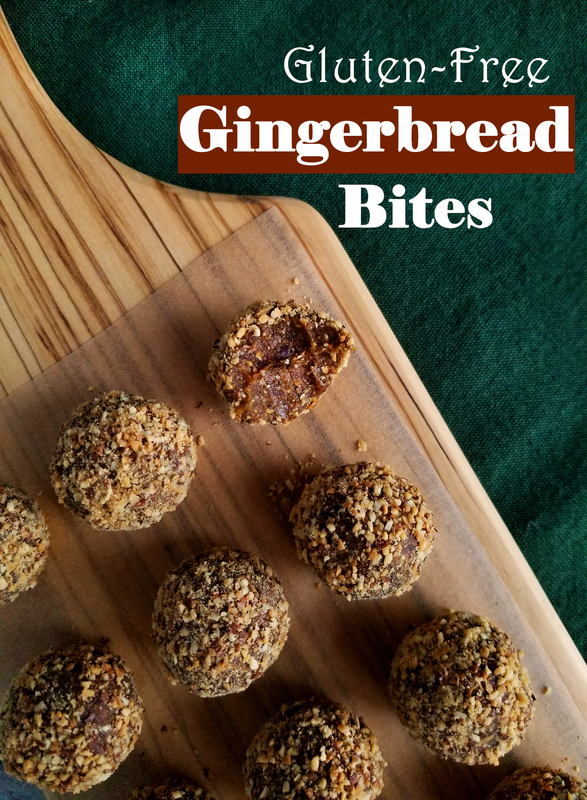 Healthy energy bites that taste like your favorite gingerbread cookie, without the guilt. Perfect snack for holiday shopping! In a food processor (with an s-blade) add the rolled oats, and pulse until broken down into flour like consistency. Then add 3 Tbsp of almond meal, spices, and salt and pulse until the mixture resemble sand. Place the gingerbread paste in a small bowl or a sheet of wax paper and place in the freezer for 5 minutes to cool down. While the dough is cooling place the remaining almond meal in a small sauté pan and cook on medium heat until the nuts are fragrant and begin to turn golden, about 2-4 minutes. Continue to stir or shake the pan to not burn the nuts. Place in a bowl and set aside. 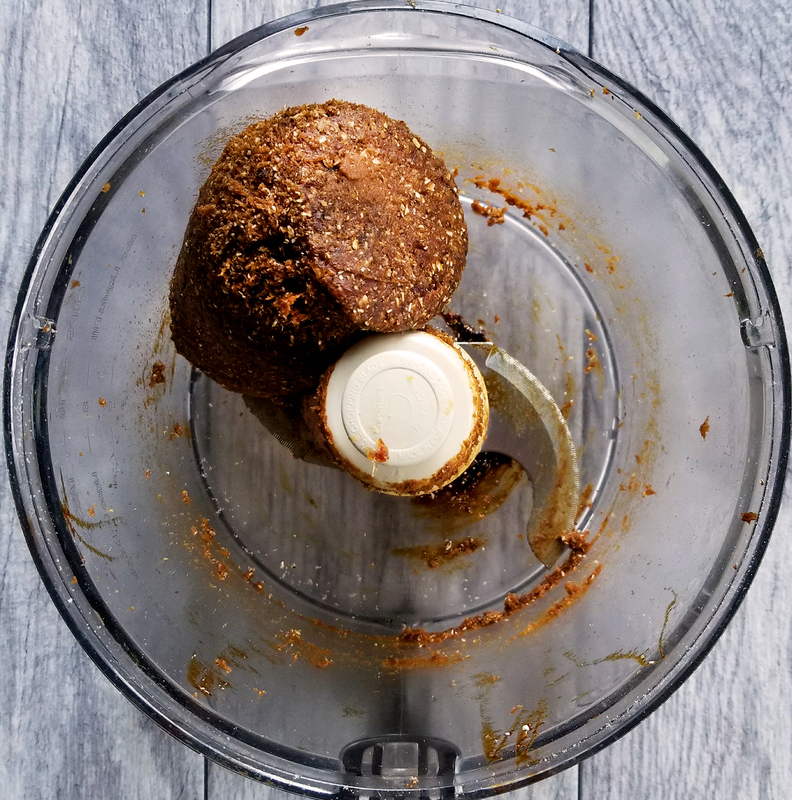 Optional: place a pinch of pumpkin pie spice (cinnamon, ginger, cloves, nutmeg) into the almond meal, this will give it a kick of spice when you first bite into the ball. Fill a small bowl with water and place on your station, dampen your hand and then take about a tablespoon of dough and roll into a ball, continue until all the dough has been shaped. 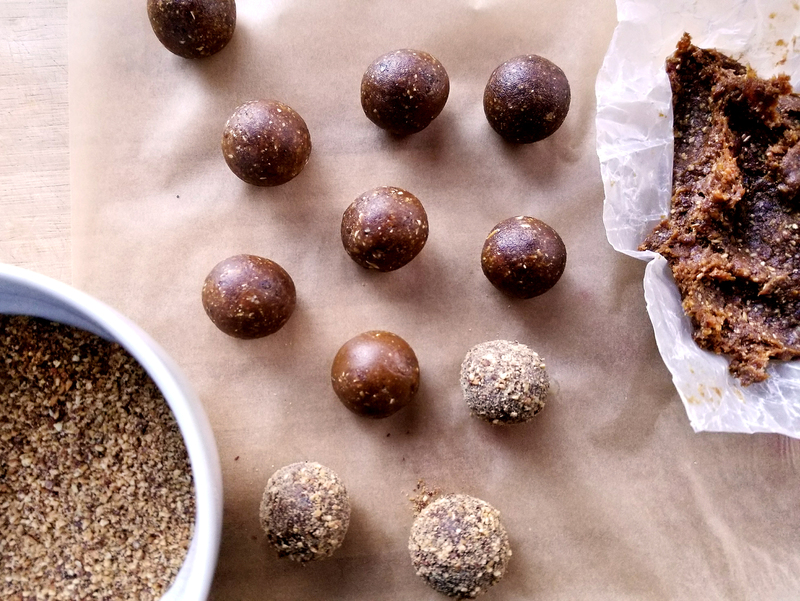 Once the balls are shaped, roll them in the toasted almond meal, if the almonds are not sticking try wetting the dough before rolling them in the nuts. These will keep in the refrigerator for a week, and in the freezer for up to a month.